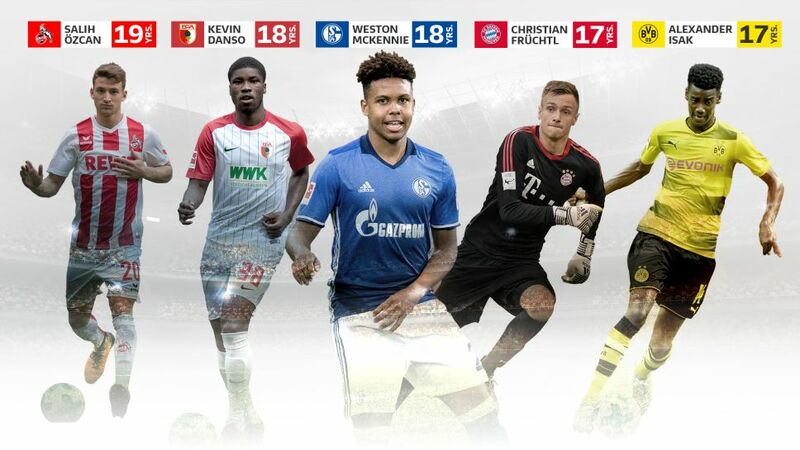 Özcan, Danso, McKennie, Früchtl and Isak (l-r.) are just some of the teenage stars set to light up the Bundesliga this season. Standing at 6’4” tall with European size 50 feet, Bayern Munich goalkeeper Christian Früchtl is the gentle giant with a big future ahead of him. The 17-year-old stopper was promoted to the first team in July, regarded by many as Bayern and Germany's long-term successor to undisputed No.1 Manuel Neuer. Kevin Danso made quite the impression on his Bundesliga debut against RB Leipzig in March. Not only did the Austrian defender become the youngest player in Augsburg history to grace the German top flight, aged 18 years and 165 days, but he also made a telling contribution to the final 2-2 scoreline. After winning 12 of his attempted challenges and hitting the money with 58 per cent of his passes against Bayern’s closest pursuers, 18-year-old Danso went on to start six of Augsburg’s next seven games, and goes into the new campaign with genuine designs on nailing down a regular place in the starting line-up. After impressing in pre-season, 18-year-old McKennie looks ready to step things up a gear in 2017/18. Promoted from the Schalke U19s in May, he made his league debut on the final day of last season, in a 1-1 draw with Ingolstadt. Now that he's been bitten by the Bundesliga bug, the highly-rated young midfielder says he's determined to fight for a place in Domenico Tedesco's starting XI. The American is confident on the ball and reads the game well. He is also ambitious, which perhaps explains why he turned down an offer from Dallas last year to return to Germany, where he spent three years as a child. Given that he has excelled this summer - notably against Turkish champions Besiktas - don't be surprised if you start seeing more of him in the Royal Blues' midfield. Cologne’s Salih Özcan is the latest midfield gem to fall off German football’s acclaimed production line. The 19-year-old midfielder made 13 appearances in his debut campaign for the senior team last term, and recently claimed the prestigious Fritz Walter Medal award for the best player in Germany in his age group. With his vision to unlock the most watertight of opposition defences and a rasping shot Jörg ‘the Hammer’ Albertz would be proud of, it is easy to see why Özcan is held in such high regard. As captain of the Germany Under-19s, he is also a proven leader around whom Cologne head coach Peter Stöger could plausibly build his side for years to come. With a new head coach in Peter Bosz at the Borussia Dortmund helm, Alexander Isak has the opportunity to start afresh in 2017/18. The wiry front man made just one competitive appearance after joining the club from Solna during the winter break, but delivered a serious statement of intent with a stunning four-goal salvo in a recent friendly against Rot-Weiss Erfurt.